Going from hunter to hunted is a big change. Connor Pearce likes it. When numbers are down like this, it can be a challenge not to get down. Wrestling is a passion for Jake Benedetto. It has been ever since he took up the sport as a youngster. It was a focal point for him as high school wrestler for East Islip and Islip, and then at the collegiate level with SUNY/Oneonta. Benedetto carried that passion over to coaching. He was an assistant coach for Unatego in upstate New York for one season, coached two seasons at Bayport-Blue Point (one year as the head coach) and then coached the Longwood and Riverhead junior varsity teams. 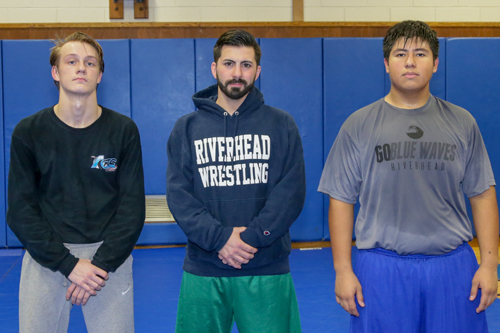 And now Benedetto finds himself as the successor to Tom Riccio, a National Wrestling Hall of Fame inductee who became Riverhead’s varsity coach in 2015.